When I took my first quilting workshop 42 years ago, it was a day long, during the day we drafted our templates, cut them out of sandpaper(! ), cut out our fabric and sewed them together. Then we stared quilting our block. Simple, right? Well for me it was, I have not stopped quilting. Things have changed though, no more sandpaper though I still will use graph paper and draft my own templates. That first block a=was called "Broken Dishes", a traditional block, one template, a triangle. 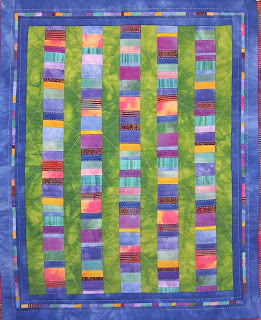 When I finished quilting it I used it for a pillow cover. many yeard later it pretty much fell apart. However I do have the second piece I quilted and the third and many more. I started out making a lot of small projects and finished them, I did not get discouraged thinking I had to make a queen sized quilt! My first quilt was "Windowpane", which I shared in my first blog post. Not too big,more like a crib sized. I did gradually work my way up to a queen sized quilt, several of them! 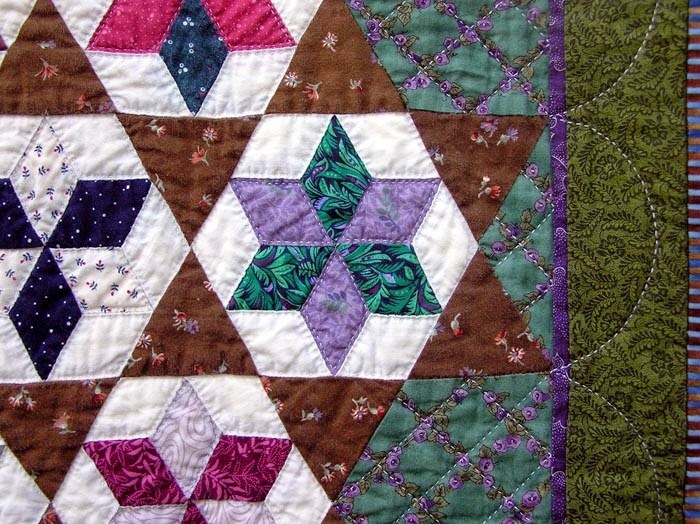 I did want to write about the wonderful process of hand quilting. It is to me, very relaxing and almost meditative. I stab stitch, I do not quilt with a running stitch. It was the way I was taught way back in that first one day workshop. It came very easy to me, I rarely had to take a stitch out. I still have that lovely 14" round hardwood quilting hoop. I used it for many years until I found the Q Snap frames, now I have just about every size from a 6" square up. I don't use a floor frame, I like the comfort of my chair where I can have my feet up and my Ott light over my right shoulder. I do have some notes on stab stitch,tricks and tips I have learned over the years. If you would like a copy email me at robsonbh@eastlink.ca and I will send you the pdf. The above two pictures are of a wallhanging "Penny Candy". You can see the stitches pretty clearly. The fabrics are batiks and hand dyed. This wallhanging was machine pieced. The benefit of stab stitch quilting is, with practice, you get even stitches which are a consistent length and the stitches are the same size on the back. Also because of the way you hold the needle there is no pressure on your hand or fingers, you don't need to wear a thimble. I will take some pictures of my hands at work tomorrow and post them. 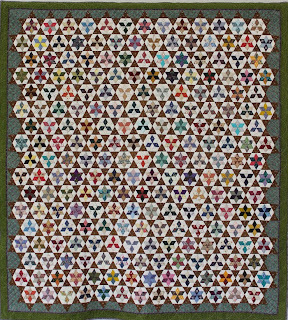 Waternish Star is based on an old quilt in the Nova Scotia Museum collection. It is hand pieced (with some machine piecing of the borders) and hand quilted. There are almost 4,000 pieces in the quilt. A detail of Waternish Star. 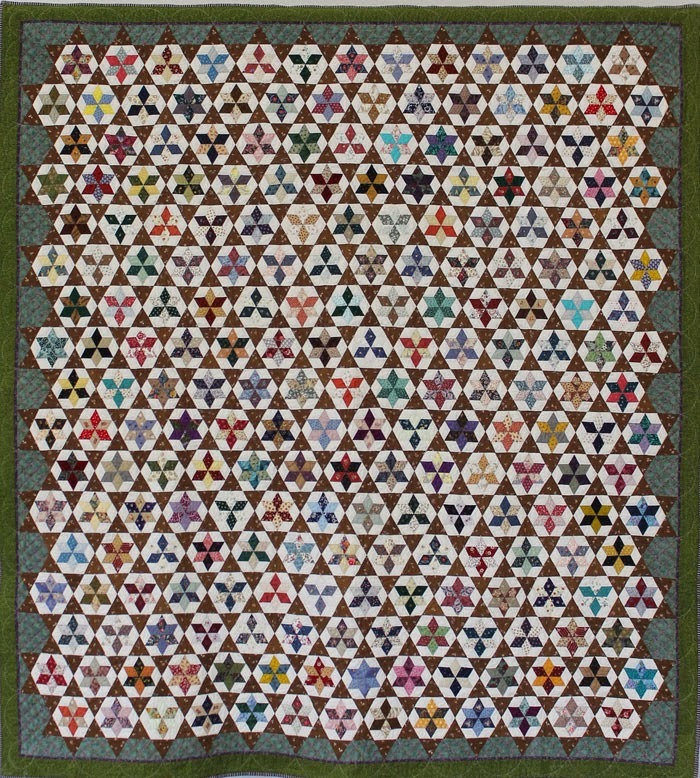 I am off to the city (Halifax) tomorrow to meet with my Mayflower Quilter's Guild bee, the Piecemakers. We have been together over 30 years! Our eldest member is turning 95 so we are celebrating! I'll be back later tomorrow afternoon! 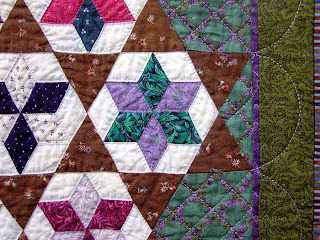 Lovely stitching and that star quilt is quite amazing! I knew quilting had changed over the years but I never heard of making a template out of sandpaper! Very interesting. 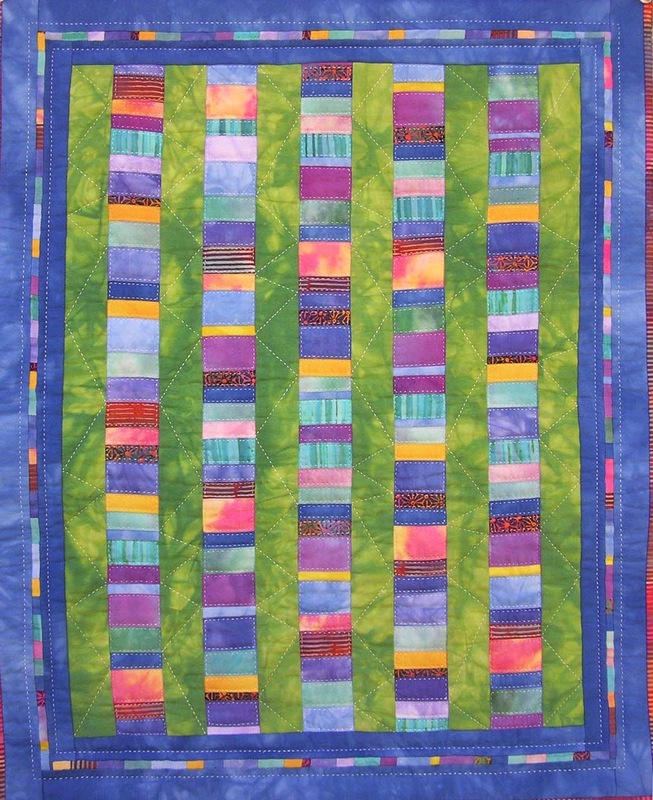 Barbara, Your quilts are so very beautiful and I envy your quilting skills! Your stitches are even and perfect! I'm so anxious to give the stab stitching method a try. Thank you for sharing here!